Theseus was a king of Athens famous for many exploits, and appearing in works by many authors and on countless vases, art and statues. There is some confusion about Theseus' parentage - some say he is the son of Aegeus and Aethra, and others the son of Poseidon and Aethra. The ancient Greek writers Apollodoros and Hyginus say Aethra waded out to Sphairia after sleeping with Aegeus, and lay there with Poseidon. The next day, Aegeus, who had been visiting Aethra at Troizen, left for his home city of Athens. As he left, he left sandals and a sword under a large rock; should Aethra bear a male child, she was to send him to Athens to claim his birthright as soon as he was old enough to lift the rock and retrieve the items. Aethra gave birth to Theseus, who came of age and set off for Athens with the sword and sandals, encountering and defeating six murderous adversaries along the way. When Theseus reached Athens, Medea, the wife of Aegeus, persuaded Aegeus to kill the as of yet unrecognized Theseus by having him attempt to capture the savage Marathonian Bull. Theseus does the unexpected and succeeds, so Medea tells Aegeus to give him poisoned wine. Aegeus recognizes Theseus' sword as he is about to drink and knocks the goblet from his lips at the last second. According to Plutarch and Philochoros, on the way to Marathon to kill the bull, Theseus encounters a fierce storm and seeks shelter in the hut of an old woman named Hecale. She promises to make a sacrifice to Zeus if Theseus comes back successful. He comes back, finds her dead, and builds a deme in her name. Some time after Theseus return to Athens, trouble stirs and blood flows between the houses of Aegeus in Athens and Minos, his brother in Crete. War and drought ensues and an oracle demands that recompense be made to Minos. Minos demands that seven maidens and seven youths are to be sacrificed to the Minotaur every nine years. Theseus is among the chosen victims and sails off to Crete, promising to Aegeus that his ship's black flag would be replaced with a white flag if Theseus is victorious. In Crete, Minos molests one of the maidens and Theseus becomes angry and challenges him, boasting of his parentage by Poseidon. Minos, son of Zeus is amused and asks Theseus to prove his heritage by retrieving a ring from the depths of the ocean. Theseus being a son of Poseidon succeeds. Ariadne, a young woman in Crete already betrothed to Dionysus, falls in love with Theseus and helps him defeat the Minotaur. Ariadne then leaves Crete with Theseus, who abandons her on Dia (at Athena's behest, according to Pherekydes). In returning to Athens Theseus forgets to switch the black sail with the white one. Aegeus, consequently, watching from afar believes his son is dead and hurls himself into the sea, named the 'Aegean' after him. After Aegeus' death, Theseus must contend against Pallas for the throne. Theseus gets wind of a planned assassination against him and spoils the ambush, killing Pallas and gaining the throne. Theseus and a good friend of his by the name of Pirithous want to marry daughters of Zeus, and begin their quest by abducting Helen. Theseus wins a bet and gets Helen, but must accompany Pirithous to Hades to recover Persephone for him. There is much disagreement here about what happens in Hades, but many traditions say only Theseus makes it back out. Theseus does two noteworthy patriotic acts to Thebes, accepting Oedipus at Kolonus, and helping Adrastos bury the Seven, fallen in the struggle for the throne of Thebes. Late in his life Theseus loses popularity in Athens and is exiled. He wanders to Scyrus where he is hurled off a cliff by Lycodemes. Theseus was a great hero from Athens who was the son of the Greek king, Aegeus. Theseus did not grow up with his father, but in fact his mother in southern Greece. King Aegeus left Theseus with his mother before the child was born. He left a sword and a pair of shoes in a hollow under a stone. King Aegeus said that if Theseus, when he was old and strong enough, could roll the stone away, then Theseus could travel to Athens to claim himself as the son of the king. Theseus, at a young age, accomplished this feat and his mother told him what to do. His grandfather left a ship for him to use to travel to Athens, but Theseus declined the offer, saying that it would be too easy for him. Theseus decided that it would be better to travel by land because he felt that he wanted to become a great hero at a young age and he believed that the safety of a ship was not the way to go about this. Theseus wanted to become as great a hero as the famous Hercules, and Theseus always had Hercules in his mind, trying to become as great a hero as Hercules. This was quite natural considering that Hercules and Theseus were cousins. So Theseus made the trek by land. It would be a long and dangerous journey because there were many bandits that roamed the countryside. To achieve the greatness that Theseus believed he should achieve, he killed every bandit on the way to Athens. Theseus' form of justice was very effective: he believed that what each of the bandits had done to others, Theseus must do to the bandits. An example of this occurred when Theseus met Sinis, a man famous for killing people by strapping people to the trunks of two pine trees that were bent to the ground. Sinis would then let the trees stand straight again, thus hurling the victim that was strapped to the trees through the air to their death. Theseus knew about this, and he killed Sinis by this method. There were many other bandits that were killed by Theseus and he killed them using the same method that each bandit used to kill their victims. When Theseus arrived in Athens, he was praised by the people for his help to kill the bandits in the country. The king invited him to the palace, not knowing that Theseus was his son. In fact, the king was frightened that since Theseus was so popular with the people that they might make Theseus the king. So, King Aegeus invited Theseus to dinner with the intention of poisoning him. This was not a plan of his, but a plan that Medea had thought up. Medea was the heroine of the Quest of the Golden Fleece who fled from Corinth to Athens in her flying chariot. She had obtained a great influence over King Aegeus and didn't want to have that changed if a son appeared in the life of the king. Theseus was invited to a splendid dinner with the king. During the dinner as Medea handed the poisoned cup to Theseus, Theseus drew his sword to reveal his identity to the king. As soon as the king caught sight of the sword, he instantly recognized his son and threw the poisoned cup to the ground. Medea, as she always did, fled without a trace to Asia. Soon after, King Aegeus proclaimed that Theseus was his son and heir. This gave Theseus the opportunity to endear himself to the people of Athens. Years before the arrival of Theseus to Athens, a terrible misfortune happened to the city. Minos, the ruler of Crete, lost his only son, Androgeus, while visiting King Aegeus in Athens. Aegeus sent Androgeus on a dangerous expedition, to kill a bull. This is something that a host should never do. As a result, Androgeus was killed by the bull. Minos invaded the country of Greece to avenge his son's death. He captured the country and threatened to demolish it unless King Aegeus sent seven maidens and seven youths to Crete every nine years. When the 14 Athenians arrived in Crete, they were given to the Minotaur to devour. The Minotaur was a creature that was half bull, half human which was the offspring of Minos' wife, Pasiphaë, and a beautiful bull. Poseidon had given the bull to Minos with the assumption that Minos would sacrifice it to Poseidon but Minos could not bear to kill the bull, so he kept it for himself. Poseidon decided that Minos should be punished, so he made Pasiphaë fall in love with the bull. When the Minotaur was born, Minos did not kill it. Instead, he had Daedalus, a great architect and inventor, build a place to confine the Minotaur so the Minotaur could not escape. Daedalus built the Labyrinth, a structure that was famous throughout the world. This was the place where the 14 Athenians were taken to when they were sent to Crete. Co-incidentally, these 14 people were sent just after Theseus arrived in Athens. After hearing the story of Minos and the tributes to him every nine years, Theseus offered to be one of the victims that was to be sent. Everyone praised him for his nobility, but they had no idea that Theseus would try to kill the Minotaur once inside the maze. He told his father that if he was successful, he would change the sail of the ship that carried the victims from black to white to tell the king of his success well in advance of his arrival in Greece. This was to show that Theseus had survived. When the victims arrived on the island of Crete, they were paraded around before the inhabitants on their way to the maze. Ariadne, the daughter of Minos, was one of the spectators and she fell in love with Theseus as soon as she saw him. She quickly summoned for Daedalus to ask if there was a way out of the Labyrinth. Ariadne promised Theseus the answer to getting out of the Labyrinth if he would take her back to Athens and marry her. He agreed to this compromise and she gave him a ball of thread which he could attach to the entrance of the Labyrinth. This would allow him to re-trace his steps whenever his wished. So Theseus made his way into the Labyrinth to find the Minotaur. He allowed the ball of thread to unwind so that he could re-trace his journey later. 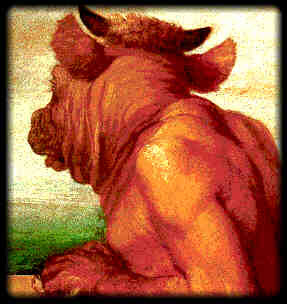 It wasn't long before he came across the Minotaur; the Minotaur was sleeping. Theseus jumped on the creature and pinned him to the ground. Then, Theseus proceeded to batter the beast to death. Once the Minotaur was dead, he got up and found his ball of thread. Theseus instructed the other people out of the maze while following the ball of thread that guided the way. They boarded the ship that they arrived on and headed towards Athens. The ship travelled to the island of Naxos where they briefly stopped over . There are conflicting stories as to what happened on the island. The first story said that while on the island, Theseus deserted Ariadne while she slept on the island. The other story, which favours Theseus more, said that Ariadne suddenly became seasick. As a result of this, she was left on the island while Theseus stayed on the ship to do some necessary work. A terrible storm carried him out to sea and when he returned, he found that Ariadne had died. Both stories agree that when they sailed near Athens, Theseus forgot to put out the white sail to show his success in Crete. It was either that he forgot to hoist the sail or that he was filled with grief over the death of Ariadne that he failed to put it out. As a result of his failure to hoist the white sail, when King Aegeus saw the black sail at the Acropolis he assumed that his son had died. He was so filled with grief that he jumped off from a rocky cliff into the sea and was killed. The sea into which he jumped was then, and still is known as the Aegean Sea. Theseus was made the King of Greece but he didn't want to be the king because he felt that a people's government where everyone would be equal would be better suited for Greece. He resigned his power and organized a commonwealth, building a council hall where the citizens would gather and vote. Theseus did keep the title of Commander in Chief of Greece. As a result of the change in government, Athens became the happiest and most prosperous of all the cities on Earth. In fact, it was the only place in the world where everyone governed themselves. It was for this that in the War of Seven against Thebes when the victorious Thebans refused to bury those of the enemy who had died, the defeated turned to Theseus for help. Theseus led an army against Thebes and conquered her and forced her to allow the dead to be buried. However, Theseus did not avenge the evil that had taken place during the war. Instead, he refused to allow his army to loot the city. He was the perfect knight. Theseus still had a love for danger. He went to the country of the Amazons, the women warriors, and brought away one of them, whose name is given sometimes as Antiope as well as Hippolyta in other cases. It is certain that it was she who bore Theseus' child who was named Hippolytus. After the birth of Hippolytus, the Amazons came to Greece to rescue her. They invaded Attica and some say they made it as far as Athens itself but were defeated by Theseus' army. After this, no other enemy invaded Greece as long as Theseus lived. He also took part in many other adventures. 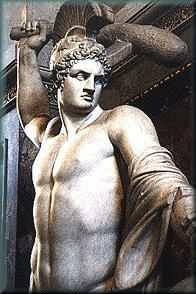 He was one of the men that travelled on the Argo that searched for the Golden Fleece. He also took part in the Calydonian Hunt where he was one who tried to kill the boar that lay waste on Calydon. He saved a man's life on this hunt, the life of Pirithoüs. Pirithoüs was a man who was as adventurous as Theseus but was not nearly as successful; he was always in trouble. Their friendship developed after Pirithoüs wanted to test what a great hero Theseus was. To test this, Pirithoüs decided to steal some cattle from Theseus in Attica. When he found out that Theseus was pursuing him, Pirithoüs met Theseus, wanting to see who the better man was. As impulsive as Pirithoüs was, he submitted to Theseus and said that he would accept any penalty that Theseus offered. After hearing this good gesture, Theseus asked that he only need be a friend of his. Another example of Theseus' helpfulness occurred during the wedding of Pirithoüs and his wife. Many Centaurs were invited to the reception. Centaurs are animals that are half human and half horse. They were related to the bride and they caused much trouble at the wedding. They became drunk and seized the women. Theseus came to the defense of the bride who was being carried off. A battle resulted from this incident between the Centaurs and the Lapithae, the people of which Pirithoüs was the king. Theseus helped to finally drive off the entire race of Centaurs from where the Lapithae lived. After the death of his first wife, King Pirithoüs attempted to get the most carefully guarded lady in the universe, that lady being Persephone. Theseus agreed to help his friend because he liked this dangerous and near impossible undertaking. Theseus suggested that Pirithoüs should attempt to win over Helen, the heroine of Troy, who was only a child at the time. Pirithoüs agreed and Theseus captured the young girl with Pirithoüs hoping that he could marry her when she had grown. Helen had two brothers, Castor and Pollux, and these two were more than a match for any mortal hero. When the two brothers arrived where Helen had been taken to, Pirithoüs and Theseus could not be found because they had slipped into the underworld. The details of this journey are not known, but the Hades welcomed the two, in hopes to amuse himself. When they arrived, Hades instructed them to sit in two chairs, which were known as the Chairs of Forgetfulness. Anyone who sat in these chairs forgot everything and did not move from the chair. Pirithoüs remained in the chair forever, but Theseus was lifted from the chair by Hercules when he travelled to the underworld and brought him back to Earth. Pirithoüs remained because the King of the Underworld knew that it was Pirithoüs who wanted to carry off Persephone. punishment by Aphrodite to hurt Hippolytus for his hate for Aphrodite. When one of Phaedra's nurses realized that Phaedra wanted to kill herself, she quickly went to Hippolytus and told him of the situation. The nurse told him that Phaedra was in love with him. However, Hippolytus was disgusted by the thought of love, but this guilty love sickened and horrified him. He went to the courtyard of the house with the nurse following. Little did he know that Phaedra was sitting there. Hippolytus did not see her and continued on with the conversation saying that he would never love any woman and that he would not enter the house again unless his father was present there. As he turned around to leave, he spotted Phaedra. Phaedra, soon after this incident, killed herself. Theseus found out about this after he made his way to the courtyard where the nurse was. The nurse informed him of Phaedra's death. Phaedra had left a letter that was addressed to Theseus. Theseus read the letter and was angered by it. Theseus told his slaves that Hippolytus had killed his wife. Just as this was occurring, Hippolytus entered the courtyard, wondering what the problem was. He was unaware that the letter said that Hippolytus killed Phaedra. He questioned his father on his stepmother's death. Theseus was angered by what Hippolytus had said and based on what the letter had said, Theseus punished him by sending him away in exile. But Hippolytus told his story and swore on Zeus that he had not killed Theseus' wife. Theseus did not believe him and maintained the banishment of Hippolytus from Greece. Hippolytus left from Greece, but not in exile. Death was close at hand for Hippolytus though. As he travelled in his chariot, a large sea monster emerged from the water and caused the horses on the chariot to run away. This knocked the chariot over and seriously hurt Hippolytus. Theseus was later told the truth by Artemis. She told him that the letter was untruthfully written and that Phaedra was madly in love with Hippolytus. Moreover, Hippolytus was innocent. As this happened, Hippolytus, who was barely living, was carried in. Hippolytus proclaimed his innocence, and only now did Theseus believe him, after hearing the truth from Artemis. Artemis had said that it was Aphrodite who had killed Hippolytus. As Artemis left from the presence of Theseus, Hippolytus died. The death of Theseus was wretched as well. He was at the court of a friend, King Lycomedes. Many people said that he had gone there because he felt that Athens had banished him. For some unknown reason, the king, who was his friend, killed him. Even if the people of Athens had banished Theseus, the people honoured him like no other mortal. They built a great tomb for him and said that it would be a sanctuary for slaves and all people who are helpless, in memory of one who through his life had been the protector of the defenseless. THESEUS was the son of AEgeus, king of Athens, and of AEthra, daughter of the king of Troezen. He was brought up at Troezen, and when arrived at manhood was to proceed to Athens and present himself to his father. AEgeus on parting from AEthra, before the birth of his son, placed his sword and shoes under a large stone and directed her to send his son to him when he became strong enough to roll away the stone and take them from under it. When she thought the time had come, his mother led Theseus to the stone, and he removed it with ease and took the sword and shoes. As the roads were infested with robbers, his grandfather pressed him earnestly to take the shorter and safer way to his father's country- by sea; but the youth, feeling in himself the spirit and the soul of a hero, and eager to signalize himself like Hercules, with whose fame all Greece then rang, by destroying the evil-doers and monsters that oppressed the country, determined on the more perilous and adventurous journey by land. His first day's journey brought him to Epidaurus, where dwelt a man named Periphetes, a son of Vulcan (Hephaistos). This ferocious savage always went armed with a club of iron, and all travellers stood in terror of his violence. When he saw Theseus approach he assailed him, but speedily fell beneath the blows of the young hero, who took possession of his club and bore it ever afterwards as a memorial of his first victory. Having overcome all the perils of the road, Theseus at length reached Athens, where new dangers awaited him. Medea, the sorceress, who had fled from Corinth after her separation from Jason, had become the wife of AEgeus, the father of Theseus. Knowing by her arts who he was, and fearing the loss of her influence with her husband if Theseus should be acknowledged as his son, she filled the mind of AEgeus with suspicions of the young stranger, and induced him to present him a cup of poison; but at the moment when Theseus stepped forward to take it, the sight of the sword which he wore discovered to his father who he was, and prevented the fatal draught. Medea, detected in her arts, fled once more from deserved punishment, and arrived in Asia, where the country afterwards called Media, received its name from her. Theseus was acknowledged by his father, and declared his successor. and fierce, and was kept in a labyrinth constructed by Daedalus, so artfully contrived that whoever was enclosed in it could by no means find his way out unassisted. Here the Minotaur roamed, and was fed with human victims. Theseus resolved to deliver his countrymen from this calamity, or to die in the attempt. Accordingly, when the time of sending off the tribute came, and the youths and maidens were, according to custom, drawn by lot to be sent, he offered himself as one of the victims, in spite of the entreaties of his father. The ship departed under black sails, as usual, which Theseus promised his father to change for white, in case of his returning victorious. When they arrived in Crete, the youths and maidens were exhibited before Minos; and Ariadne, the daughter of the king, being present, became deeply enamoured of Theseus, by whom her love was readily returned. She furnished him with a sword, with which to encounter the Minotaur, and with a clue of thread by which he might find his way out of the labyrinth. He was successful, slew the Minotaur, escaped from the labyrinth, and taking Ariadne as the companion of his way, with his rescued companions sailed for Athens. On their way they stopped at the island of Naxos, where Theseus abandoned Ariadne, leaving her asleep. His excuse for this ungrateful treatment of his benefactress was that Minerva appeared to him in a dream and commanded him to do so. On approaching the coast of Attica, Theseus forgot the signal appointed by his father, and neglected to raise the white sails, and the old king, thinking his son had perished, put an end to his own life. Theseus thus became king of Athens. One of the most celebrated of the adventures of Theseus is his expedition against the Amazons. He assailed them before they had recovered from the attack of Hercules, and carried off their queen Antiope. The Amazons in their turn invaded the country of Athens and penetrated into the city itself; and the final battle in which Theseus overcame them was fought in the very midst of the city. This battle was one of the favourite subjects of the ancient sculptors, and is commemorated in several works of art that are still extant. The friendship between Theseus and Pirithous was of a most intimate nature, yet it originated in the midst of arms. Pirithous had made an irruption into the plain of Marathon, and carried off the herds of the king of Athens. Theseus went to repel the plunderers. The moment Pirithous beheld him, he was seized with admiration; he stretched out his hand as a token of peace, and cried, "Be judge thyself- what satisfaction dost thou require?" "Thy friendship," replied the Athenian, and they swore inviolable fidelity. Their deeds corresponded to their professions, and they ever continued true brothers in arms. Each of them aspired to espouse a daughter of Jupiter. Theseus fixed his choice on Helen, then but a child, afterwards so celebrated as the cause of the Trojan war, and with the aid of his friend he carried her off. Pirithous aspired to the wife (Persephone) of the monarch of Erebus; and Theseus, though aware of the danger, accompanied the ambitious lover in his descent to the underworld. But Pluto (Hades) seized and set them on an enchanted rock at his palace gate, where they remained till Hercules arrived and liberated Theseus, leaving Pirithous to his fate. After the death of Antiope, Theseus married Phaedra, daughter of Minos, king of Crete. Phaedra saw in Hippolytus, the son of Theseus, a youth endowed with all the graces and virtues of his father, and of an age corresponding to her own. She loved him, but he repulsed her advances, and her love was changed to hate. She used her influence over her infatuated husband to cause him to be jealous of his son, and he imprecated the vengeance of Neptune (Poseidon) upon him. As Hippolytus was one day driving his chariot along the shore, a sea-monster raised himself above the waters, and frightened the horses so that they ran away and dashed the chariot to pieces. Hippolytus was killed, but by Diana's assistance AEsculapius restored him to life. Diana (Artemis) removed Hippolytus from the power of his deluded father and false stepmother, and placed him in Italy under the protection of the nymph Egeria. Theseus at length lost the favour of his people, and retired to the court of Lycomedes, king of Scyros, who at first received him kindly, but afterwards treacherously slew him. In a later age the Athenian general Cimon discovered the place where his remains were laid, and caused them to be removed to Athens, where they were deposited in a temple called the Theseum, erected in honour of the hero. The queen of the Amazons whom Theseus espoused is by some called Hippolyta. That is the name she bears in Shakespeare's "Midsummer Night's Dream," - the subject of which is the festivities attending the nuptials of Theseus and Hippolyta. Mrs. Hemans has a poem on the ancient Greek tradition that the "Shade of Theseus" appeared strengthening his countrymen at the battle of Marathon. Theseus is a semi-historical personage. It is recorded of him that he united the several tribes by whom the territory of Attica was then possessed into one state, of which Athens was the capital. In commemoration of this important event, he instituted the festival of Panathenaea, in honour of Minerva (Athena), the patron deity of Athens. This festival differed from the other Grecian games chiefly in two particulars. It was peculiar to the Athenians, and its chief feature was a solemn procession in which the Peplus, or sacred robe of Minerva, was carried to the Parthenon, and suspended before the statue of the goddess. The Peplus was covered with embroidery, worked by select virgins of the noblest families in Athens. The procession consisted of persons of all ages and both sexes. The old men carried olive branches in their hands, and the young men bore arms. The young women carried baskets on their heads, containing the sacred utensils, cakes, and all things necessary for the sacrifices. The procession formed the subject of the bas-reliefs which embellished the outside of the temple of the Parthenon. A considerable portion of these sculptures is now in the British Museum among those known as the "Elgin marbles."